WordPress Upload - Navigate to Appearance -> Add New Themes -> Upload. Go to browse, and select the zipped theme folder. Hit “Install Now” and the theme will be uploaded and installed. Some webservers have a limitation for the maximum allowed size of files being uploaded to them and that value may be exceeded by the theme file. If that is the case you can receive an error that states: The uploaded file exceeds the upload_max_filesize directive in php.ini. or Are you sure you want to do this? Please try again. If you get any of these errors please increase the values of upload_max_filesize and post_max_size directives in your php.ini file to 20M or follow the Installation via FTP section described above. Once the theme is uploaded, you need to activate it. Go to Appearance -> Themes and activate your chosen theme. All the plugins which are not free come under our EXTENDED License, so you don’t need to pay for their license to use them. Some of them might have messages requiring activation, but they are already activated on our side. No purchase code needed. When using them under our license you will need to wait for the plugin updates in our regular theme updates. If you want to be able to auto update them from wp-admin, you will need to buy your own personal license for that. Also you can update included plugins via upgrading the theme. We include latest versions of plugins in every update of the theme. To set up the homepage you must create a new page, you can do so by navigating to Pages > Add New. Actually, you can set any page to be your homepage. Once it’s created you can setup your homepage layout by means of Visual Composer. As you can see the homepage just like any the page is now 100% constructible out of the widgets we have in Visual Composer. 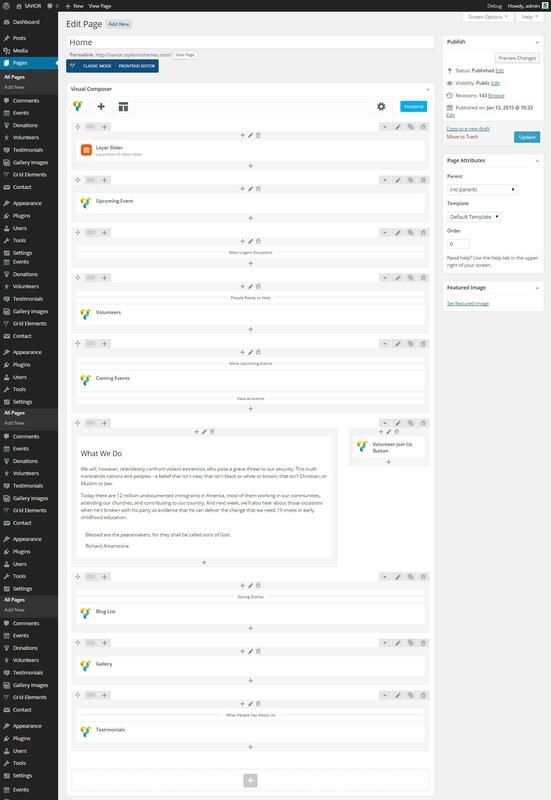 The Bootstrap layout is split into 12 columns. Each widget has its own maximum and minimum widths, so depending on that you can work out the layout for each page. As you can see the homepage just like any the page is now 100% constructible out of the modules we have in Visual Composer. The homepage can be created by any element in Visual Composer.